has reached epidemic proportions globally, with more than 1 billion adults overweight (at least 300 million of them clinically obese) and is a major contributor to the global burden of chronic disease and disability. Childhood obesity is already epidemic in some areas and on the rise in others. Its prevalence has rapidly increased in the past two decades, and today an estimated 22 million children under five are estimated to be overweight worldwide. Differences in feeding behaviour and mother-child interaction may account for some of the differences reported. 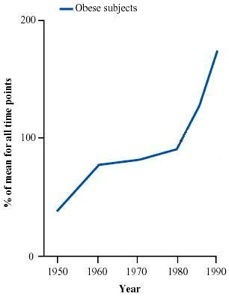 Diet-related differences in the circulating levels of biochemical markers (such as leptin, ghrelin, insulin-like growth factors, and other compounds) implicated in energy metabolism during infancy might explain some of the anthropometric and behavioral differences between breastfed and formulafed infants. Breastfeeding is the feeding of an infant or young child with breast milk directly from female human breasts (i.e., via lactation) rather than from a baby bottle or other container. Esclusive breastfeeding provides optimal nutrition and health protection for the first 6 months of life and breastfeeding with complementary foods from 6 months until at least 12 months of age is the ideal feeding pattern for infants. Breastfeeding is an important public health strategy for improving infant and child morbidity and mortality, improving maternal morbidity, and helping to control health care costs. Health outcomes differ substantially for mothers and infants who formula feed compared with those who breastfeed. For infants, not being breastfed is associated with an increased incidence of infectious morbidity, as well as elevated risks of childhood obesity, type 1 and type 2 diabetes, leukemia, and sudden infant death syndrome. Colostrum , a thick, yellowish milk secreted in the first several days after delivery. It has increased concentration of calcium, potassium, proteins, fat-soluble vitamins, minerals and antibodies. The volume is approximately 100 cc's (3 oz.) in a 24-hour period. Due to its high concentration of antibodies, this milk is particularly valuable for infants in preventing infection. Transitional milk, secreted between about four days and ten days postpartum. It is intermediate in composition in between colostrum and mature milk. The volume increases during this time. In addition to the appropriate amounts of carbohydrate, protein ad fat, breast milk also provides vitamins, minerals, digestive enzymes and hormones: all of the things that a growing infant will requires! We can consider the protective action of breastfeeding in preventing obesity like a synergy of comportamental and biochemical factors. 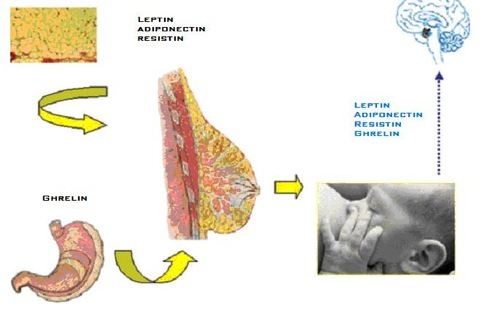 This action is mediated by many hormones content in human-breast milk, like Leptin, Adiponectin, Resistin, Ghrelin and IGF-1 because their signalling pathways are strictly linked with lipidic and glucidic metabolism; this become clear looking the rule of this hormones in the pathogenesis of obesity, insulin resistance and metabolic syndrome. Finally, it result an anti-obesity action of all these hormones, and their presence in breast milk can be protective for children overweight. The problem of "formula milk" (used in non-breastfed children) is that whey proteins added to formula are isolated from skimmed cow milk and leptin associated with milk fat globules would be removed during the skimming process. Instead with not skimmed milk (that paradoxically contains more fats than skimmed one, but more hormones too) can we have an antiobesity action mediate by PPAR alfa, delta and RXR alfa activated from leptin and other milk components?